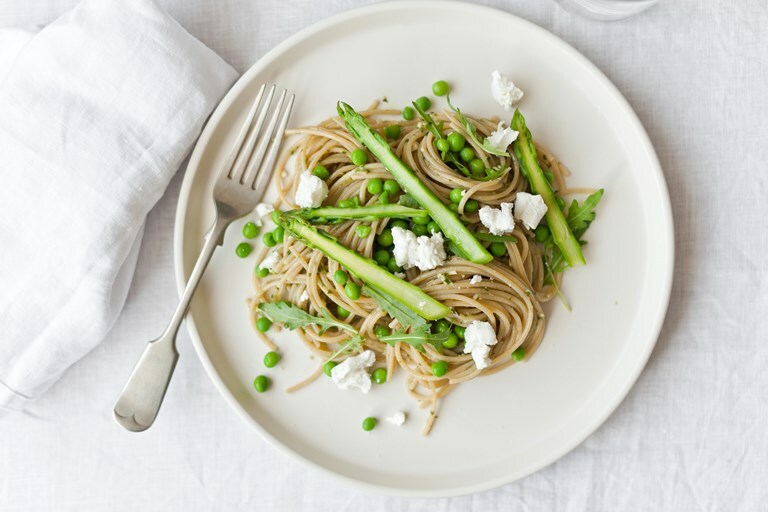 Valeria's stunning asparagus spaghetti recipe is served with a peppery rocket pesto, fresh goat's cheese and peas for a beautifully fresh pasta dish. Everything about this pasta dish shouts ‘spring’, from the many shades of green to the seasonal array of ingredients, which counts peas, asparagus and goat’s cheese. Flavours are delicate and fresh, in line with the season. However, they are enhanced by the mild pepperiness of the rocket pesto, which acts as a backbone for the ensemble – it gives it personality – but also as the binding element that brings it all together. If you’re in a hurry, you can swap the rocket pesto for the more common basil pesto. As for the vegetables, if you’d like to change things up, rest assured that broad beans, fine beans and snow peas will work just as well as the garden peas.